Fresh, youthful, extremely fine and fruity. Dry, balanced and elegant. Produced with Sangiovese grapes the estate's most suitable vineyard, is a Morellino di Scansano "Cru". Powerful and also warm and enveloping, it gives new astonishing territorial sensations to this noble variety. Delicately grassy, full and rich in nuances. Dry, full-bodied, with a deep herbaceous background. Winemaking: Guyot system. Harvested by hand in mid-September, just when the ripe grapes are turning color. Soft pressed - Brought to cold temperature to allow a separation of the sediment. Fermented and matured on the yeasts for 6 months in cement vats with the exception of 20% of the Friulano which is kept in 10 year old tonneaux for 6 months. Ruby red in colour. On the nose, fragrant, fruity bouquet with hints of flowers. 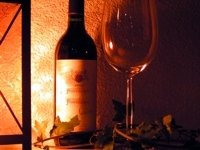 This is a very versatile piedmontese wine and a perfect match for a variety of dishes. Straw-yellow colour. Fragrance of flowers and fruit with hints of peach. Full and rich taste, soft and harmonical with tones of noble aromas, resulted the complete ripening of the grapes, which intensify the character. Ruby red in colour; on the nose, intense bouquet of mature red berries fruits; on the palate well structured and very pleasing. The vintage 2015 is the product of seven varieties two of which are the core of the blend since ealier vintages: Cabernet Franc and Sangiovese. Intense ruby colour with violet reflexions. In the nose spices, green pepper and vanilla, very long and fine perfumes of fruit of wood. To the palate it is an elegant, balanced wine. The tannins give a sensation of freshness, long and with sweet final. Made Cabernet Sauvignon grapes with a small percentage of Sangiovese, this wine dues its big character and ample body to the extraordinary terroir in which it borns. It represent the first wine of the Estate. deep ruby in colour with garnet tints, full and complex bouquet of black fruits, generous flavour, pleasantly tannic with an aftertaste of fruits of the forest.